Natural Chemistry DeFlea flea and tick shampoo products are guaranteed to kill fleas, ticks, mites, and lice safely and effectively. It contains dioctyl sodium sulfosuccinate undecyclenic acid to soften the waxy skeleton of fleas, ticks, lice, mites, and other insects until the internal organs are saturated and the insect quickly dies. Gentle yet powerful and works on all stages of the insects' life cycle without using harsh chemicals or pesticides. Will not lose effectiveness over time. Can be safely used with other flea control products; Effectively kills fleas and ticks while relieving skin irritations and fleabite dermatitis. 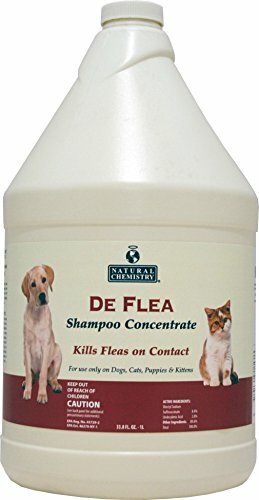 DeFlea Flea and Tick Shampoo is safe for use on dogs, cats, puppies, and kittens over 6-weeks old. Available in 1-gallon size. Active Ingredients are Dioctyl Sodium Sulfosuccinate, (a surfactant) 8.4 percent and 2.0 percent Undeclyenic acid - a derivative from the caster bean. Both Ingredients are natural, biodegradable and 100 percent safe for pets, people, and the environment. Percentage given is for concentrate. Use as often as needed. Apply to dry coat. For best results, lather and leave on for 5 minutes. Rinse. Measures 12-inch length by 6-inch width by 6-inch height. If you have any questions about this product by Natural Chemistry, contact us by completing and submitting the form below. If you are looking for a specif part number, please include it with your message. DERMagic Skin Rescue Shampoo Bar, Lemongrass & Spearmint, 99% Organic, 3.75 oz.